It all began in 1979, as the hobby of three friends working together in a small loft in San Francisco’s Embarcadero section. Positive recognition at art shows and exhibits prompted a move cross-country to New York. Now situated in the picturesque Hudson River Valley, Jeff's Hudson River Inlay is dedicated to excellence, pairing exceptional quality with affordable price. The ancient craft of marquetry utilizes the natural colors and textures of exotic veneers to compose pictures and designs of elegant beauty. The individually cut pieces of fine hardwood veneers are expertly laminated to rigid panels to form complex images. His mirrors and pictures are of the highest level of craftsmanship and artistry. Jeff begins each piece of inlay with a rough sketch. The next step is to capture the essence of his subject with just a few subtle lines that convey its motion and vitality. 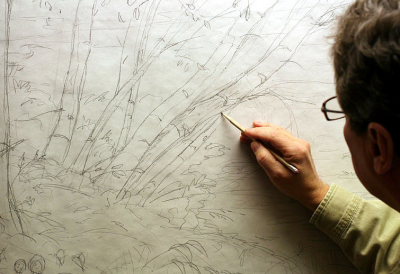 The result is a final line drawing that serves as a blueprint for each individual piece of art. Next, Jeff carefully selects the various woods for his palette, with an eye for the natural grains and hues of the veneers that will give warmth and subtle shading to the finished work. The veneers are precision cut, then assembled and finished by hand to form the one-of-a-kind wood image. The result is a masterful piece of marquetry art of unmatched beauty and elegance.